According to the video the new Ozone alpha is amazing and it can do everything!! Which is exactly what I would say if I was selling this kite!! In all seriousness the kite does look awesome, like somewhere between a reo and an enduro but with the lightweight 1 strut low wind and drift capabilities. I am happy to see ozone getting in on the 1 strut game. From my experience with my airush ultra i am a big fan of the 1 strut platform and it actually does do foil, surf and twin tip quite well so i do somewhat believe ozones claim that the alpha is amazing at everything. Also on a recent trip down south the North Mono's had a big presence in the lineup at Margaret River mainbreak which I believe says a lot for thier cred as a serious wave kite!! 1 strut kites are legit!! Well the reo seems to come in at a comparable weight to the north mono. This kite should weigh less than Fck all. I'm thinking this kite will be very good. I freefoiled the other day with the 7m V5 Reo and it was very good, the alpha should be even better. Looking forward to getting our demo's soon. They had the Uno for a few years now. Single strut. Up to 6m only but that's fine for nuking WA winds and foiling. Probably underrated as being sold as trainer kite. Yeah, it's about time that Ozone got with the program. I've seen Youngbreezy out on his Ultra foiling, and it's an impressive kite. Hopefully Ozone have spent all this time out of the 1 strut market perfecting the Alpha. I will definitely be in the market for an 8m version. The quoted weights are lighter than the airush ultra (2.2kg for the 10m alpha vs 2.45kg for the ultra 10m). Makes you wonder if they will bother developing a hyperlink V2 if this thing is so light and yet can do it all. Looking forwards to a few reviews myself. I use the v4 6 Reo at around 18 to 20 knots to foil, then over 20+ I use a 4 Uno. It is a super fun kite to fly. Saying that I think I will just stick with the Reo as the V5 is such a fantastic kite and an improvement on the already super v4. This year I upgraded my 8 to a V5 and it's sensational. I wonder what the weight difference is between the two models. I can see a single strut being pretty good for traveling. The 6 mtr Alpha is AUD$450 more than the 6mtr Uno, I wonder where the differences are? Haha that's a fair point. I asked if it was a scaled up version of the Uno and Ozone said they tried this but it just didn't work in the bigger sizes so they had to start from scratch in their CAD program. Would be interesting to compare the two 6m kites though. I had a 9m Ultra which I liked but it wasn't being used when I got Hyperlinks. I had planned to keep it and use it for wave and freeride boosting and looping sessions so I emailed Airush and asked if it could withstand heavy extended looping sessions. They advised against that treatment with that kite which wasn't an unexpected response so I sold it. Ozone seem to be indicating regular loading like looping as part of normal usage expectations for their mono strut kite, or am I reading to much into their promo? You would have to surely be sensible here. Lack of frame support (especially in the bigger sizes) can only mean stress applied will make the canopy work much harder. It can only stretch it quicker... unless ozone have some new space age materials developed they haven't told us about. Reckon you would be asking for trouble if you looped and loaded a single strut kite from any brand. So what does the same size reo weigh then ? I would agree with this and would say canopy stability and ultimate top end is the big compromise in 1 strut kite design, which is obvious really! Over the last couple years i have moved away from twin tips and focused a lot more on surf and to a lesser extent foiling. From my limited experience tt boosting on the airush ultra ( 3 sessions exactly) I have been pleasantly surprised by it's jumping ability. 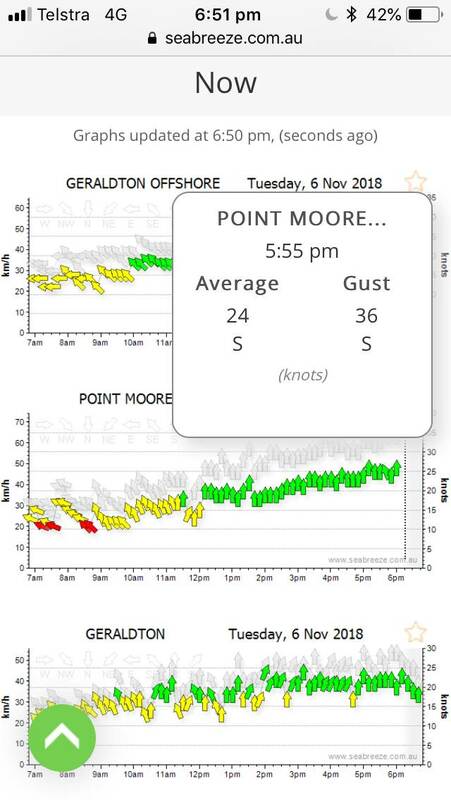 I have been out in winds 20-25 Knots and the boosting and hangtime in this range is really good, it seems pretty close to my old 10m naish pivot. BUT I wouldn't be confident with the ultra in winds much above 25knots whereas I have been out on the pivot many times in winds around 30 knots and could hold down a lot more power. In order to maintain control and stop the canopy flapping you need to ride a bit more sheeted in and maintain rear line tension. As you start to reach the top end this becomes more difficult also when the canopy flaps in stronger winds its a lot more violent and worrying than in low winds. It's at this point where a 1 strut kite tops out and something with more struts shine through. With that said because the ultra fly's really forward in the window it doesn't get overpowered too quickly and is manageable as it approaches its top end, but top end isn't what it's designed for and everything has its limitations. For my quiver I will keep 3 struts for the smaller sizes and 1 strut for the bigger. I currently have 7m wave 9m ultra but will get 5m wave very soon and 12m ultra after summer. Overall it's a matter of horses for courses if you ride styles where the kite is in the lower end of its power band, surf or foil, then 1 struts can be awesome but if your maxing out twin tip boosting your gonna need the most solid frame you can find. With that said because the ultra fly's really forward in the window it doesn't get overpowered too quickly and is manageable as it approaches its top end, but top end isn't what it's designed for and everything has its limitations. IMHO thats the reason why the Ultra isn't brilliant for boosting. Its a little too easy to edge the kite to the edge of the window so you can easily overwhelm it with edge when you set up to jump. Its designed in though as you'd never be able to generate the same level of edge on a foil so its a necessary design characteristic. 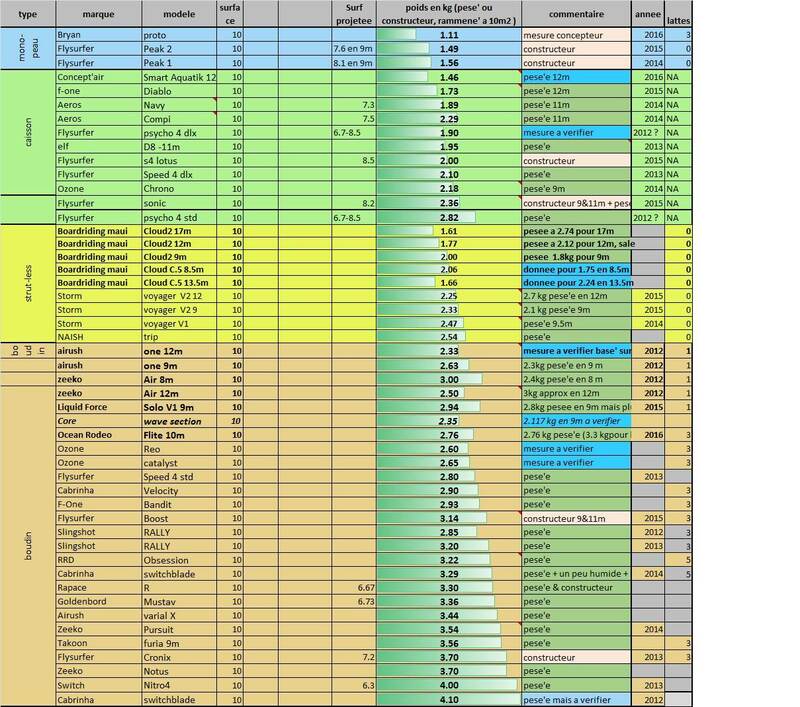 I'd be amazed if its not the same for the Ozone alpha but I'm willing to wait for test reports as it may turn out to be a winner. Quad-Tex ripstop fabric and good all round performance. I have a 5m Boxer which works great with my foil but when the wind's up it's good on a twin tip with surprisingly floaty jumps and also fast turning with good drift on a surfboard. No fluttering and really strong construction, short of smashing it hard onto oyster covered rocks I reckon you could loop and load it all day and it wouldn't affect it at all. The quad-tex canopy really looks and feels bomber. I strongly disagree! Firstly BRM cloud is only available in the US which for me means i can pretty much forget about it, I am not about to wrangle some sort of deal to get a kite over here and pay a lot extra for something with effectively no warranty or customer support. There are other strutless kites available on the international market but there is a good reason why all the major brands have brought out 1 strut kites instead of no strut kites. The 3 main factors as I see it- relaunch, upwind and wind range. All of these are undeniably ( someone's definitely gonna argue this one) better with a 1 strut kite than with a no strut kite. Effectively with a 1 strut kite you get the advantages of having a very light weight kite but still retain the user friendly characteristics of a normal LEI. You say if you want an all rounder just get a 3 strut kite? Yes this is mostly true but a 3 strut kite will not match the performance of a 1 strut kite in the very low end. With the light weight comes the ability to fly comfortably and relaunch in very low winds but also the kite retains its agility, responsiveness and drift at its lowest end. If you are foiling or riding waves these advantages are immediately apparent. Also in WA we have sharks and I often kite very far out in the ocean, when you consider all the factors a 1 strut kite has the best chance of getting you back to shore safely. Sure there are kites that do specific things better but the 1 strut platform makes for a great easy to use LEI with some real advantages and therefore I believe it's not a gimmick and here to stay. Yep, our demo order should arrive in time. Well in between getting up and breakfast I checked the forecast hoping for a miracle and then stumbled on this thread. I recently bought a small cooking scale to weigh stuff for the website, so I went and weighed 4 kites. These are not new kites and were slightly damp and had some sand on them. What does this all mean? Not sure, other than Ozone knows how to make light kites that fly very well and so I hope the Alpha V1 will live up to that reputation. My boss Iain, his friends and their kids have been putting the Alpha through its paces and they are really happy with it. Minimal flutter, great bottom end, excellent turn rate and drift and particularly aimed at foiling and lightweight travel kites suitable for wave riding and TT freeriding. 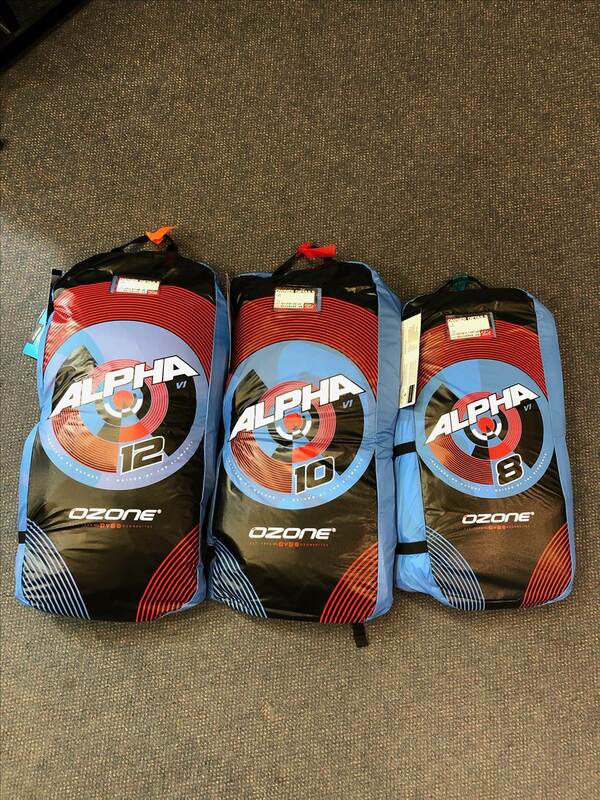 Unfortunately Ozone released the Alpha V1 without much lead time for dealers to get hold of stock, so we are all still a week or so away from getting our demo's. Ozone is not new to single strut kite, they have had the Uno in their lineup for several years now, but they found that the overall design did not work well in any size larger than 6m, and the Uno was also not designed to have an adult weight hanging off it. Kite foiling is going to continue to grow and this is what drove Ozone to design a single strut kite. In the process they discovered that single strutters do not work well in sizes larger than 12m, the lack of canopy support leads to ever diminishing performance in terms of upwind and wind range. We have the Ozone Enduro V2 in 14M which is an excellent kite in lighter winds or for big people, and the Zephyr and Edges for tube kite low end, and for extreme low end we have all the foil kites, especially the UL versions. My 13M Chrono3 UL has more bottom end than my Zephyr V5, as many people up around home in Lennox have seen many times now. Weight is critical in low end performance and stability and Ozone is sticking with Technoforce D2 for that reason. Teijin approached Ozone with samples of 3 and 4 strand ripstop materials, Ozone tested them for strength and durability and found no real difference other than weight. With anything that flies low weight and performance are linked, and great designers pursue them both with a passion! Why didn't they go with the normal Ozone bags? These look like plastic bags....?